The Jamaican rice rat is an extinct rodent from Jamaica. 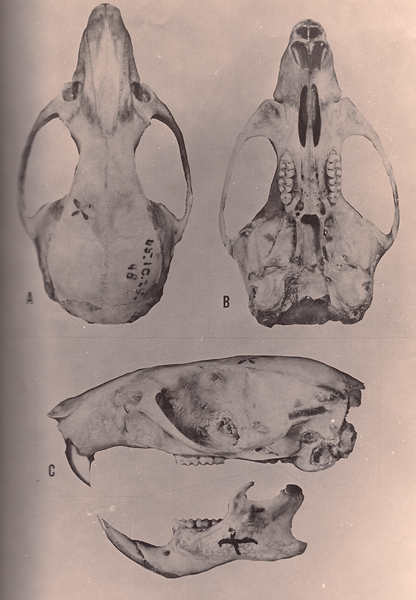 This rat was thought to have dispersed into Jamaica during the last glacial period, and is known via 3 specimens that were collected live during the 19th century. In addition, it is commonly seen as a sub-fossil in caves. Jamaican rice rats were medium-sized. They had a head to body length of 120 – 132 mm, and its skull was about 30 mm long. Its underparts were reddish and graded into yellow. Its tail was equally as long as its head and body, and was not very hairy. Historical records show that the Jamaican rice rat became extinct in the 1870’s and was actually listed as this by the IUCN Red List. Its extinction is linked to the small Asian mongoose which was introduced in 1872. On the other hand, some people think that this is an overrated idea. Some say that it may have been affected by the environmental changes that occurred in Jamaica after the British took over in 1655. During this period, most of the island was used for cultivation, so the natural habitat of the Jamaican rice rat was destroyed. The Jamaican rice rat was reduced to competing with introduced rats in human-made habitats, to which its competitors were more well adapted such as the brown rat. It is also thought that dogs and cats may have preyed on the Jamaican rice rat which led to its demise.